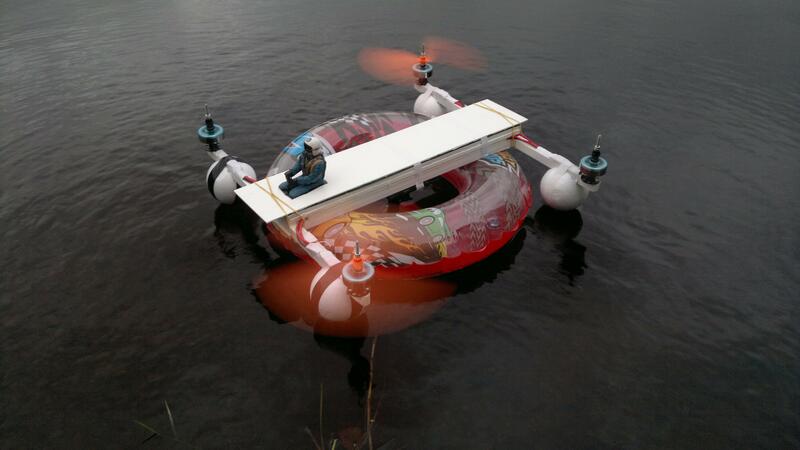 Imagine a quad-copter combined with a big shelf. Meet the H-Quad. We didn't invent it, but Josh Bixler sure built a good one. It's not quite as aerobatic as an 'X' or '+' quad, however... it sure can haul a lot of FPV crap! Functional multirotors are gaining popularity, so we were certain this would be a worth while build. GOOD EPISODE !!! keep them coming more often ! One or two of those amazing quads, a bunch of LiPo's, a good camera, and an FPV system is all I need to get started with a business! There are plenty of others, try a few until you find 1 that you like. The seisomograph app is an interesting idea. In order to really use it effectively, a test stand could be built to mount the motor and motor/props on. I imagine that tracking down the source of vibration with 4 motors running is, well 4x as hard. ... all I need to get started with a business! Quite frankly production cost for a Hero2 is probably not much over $100. Cost to resellers is probably about $200. Cost to the customer is as much as they are willing to pay and unfortunately until a lower priced alternative shows up the GoPro price fixing and gouging will continue. The hero2 just has a lens and high pixel sensor. I bet Chinese could make those for 50$ or less. Good alternative, but it doesn't fit nicely on our quadcopters or hexacopters like the DJI 450/550. Also not suitable for the gimbals that are designed around the oh-so popular GoPro. The comparison vids still show that the GoPro is a better quality camera. Too bad they stopped selling the GoPro 960 .. When shooting at the required 60fps for FPV (720p only) the Hero HD and Hero2 HD don't have much benifit. If someone where to get a 960 ore someone has one and wants to upgrade to a Hero2 .. I'm interested ! Anthony, what is the feasability for HK offering the GoPro camera's (without the std large boxing).. I will forward your valuable idea to the relevant department, thank you. How did you contact anthony? Is he on the forum? Or email?? Congratulations on a nice looking build. Honestly, I have had zero interest in quad or tri copters but this one actually has me thinking. I don't like that the multirotors don't look like anything full size, but this has some posibilities. I have seen a few really nice quads where my brother flies and they seem like fun, I think an H-copter would be a cool thing to show up with. Now you need to make a larger heavy lift version H8 kind of like the Y6. You are currently a HobbyKing Platinum EliteClub member, which means you have either placed a substantial number of orders or contributed greatly to the R/C Community. As an EliteClub member you are also offered certain privileges which will be communicated to you via email or in your account section (here) from time to time. EliteClub members can also use the 'Bug-The-Boss' feature. Allowing you to send a short message directly to HobbyKings director informing him of an issue or suggestion. I do not believe the e-mails actually are being sent to Anthony directly. But I get an instant reply every time ..